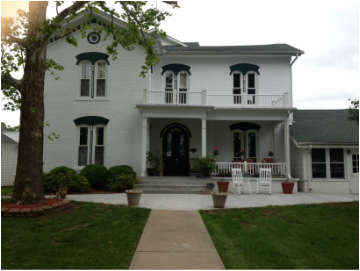 Georgetown Country View Estate is a Country Inn and Bed & Breakfast located on 80 acres three miles north of Sedalia, MO. Our guest rooms are filled with antique furniture, all have private baths and two King suites with 2-person jetted tub. Enjoy sitting outside on the porch or in the yard on the swings, use the inground pool and hot tub, play pool in the pool room, exercise in the exercise area, or relax in our many sitting parlors. We have a great setting for outdoor weddings, receptions, family reunions, and parties using our commercial tent.